When we locals refer to Northern Arizona, we’re talking about Prescott, Sedona and Flagstaff, the parts of our State that actually experience all four seasons. Traveling to northern Arizona means you’ll leave the 60 foot saguaros of the desert for 60 foot ponderosa pines of the mountains. It is a very different experience than the desert in Central and Southern Arizona. Prescott and Sedona offer a break from desert golf. It’s about a 90 minute drive from Phoenix/Scottsdale so you can go up and back in one day. But if you want to extend your stay, there are plenty of places to rest and relax. This town was the original state capital of Arizona and is a favorite for summer homes of Phoenix locals. It has a charming downtown area and the famous Whiskey Row, featuring some of the coolest watering holes around. Downtown Prescott is charming and home to the St. Michael and Hassayampa Inn, our recommendations for overnight stays. The Hassayampa Inn is reported to be haunted by a ghost named Faith, who checked in for her honeymoon in 1927. Her husband left to buy a pack of cigarettes and never came back. Faith was so distraught she hung herself, but her spirit lives and has been seen many times at the hotel. There are also a collection of chain hotels in Prescott so whether you choose this option or those listed above, they will all be a short drive from Antelope Hills, the local muni featuring 36 holes. Prescott Valley, just east of Prescott also has a collection of national chain hotels. This option will put you closer to Stone Ridge, the Hassayampa Golf Club and Prescott Lakes. Sedona is famous for two things – the Red Rocks and its vortexes. If you’re a spiritual kind of person, you will no doubt feel the highly concentrated energies of the town. The red-rock monoliths, named Coffeepot, Cathedral and Thunder Mountain are stunning and worth a drive just to see them. 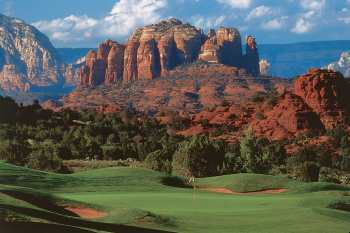 The must-play gem in town is Sedona Golf Resort and definitely worth the 90 minute drive from Phoenix. It is literally across the street from the Hilton Sedona Resort so if you decide to stay, this is a good choice. The 10th hole is one of the most visually stunning spots on the planet, like the 3rd at Mauna Kea or the 18th at Pebble Beach, that those who don’t play golf never get to see. Sedona also has incredible 5-star resorts including L’Auberge de Sedona, Los Abrigados Resort, Sedona Rouge and El Portal. All offer luxury accommodations in tranquil settings plus amenities that will definitely leave you feeling pampered. The town isn’t that big, so just about any choice you make will put you with 15-20 minutes of Seven Canyons, a private facility with limited public play, Oak Creek Country Club and Verde Santa Fe. Flagstaff is home to the 14,000 foot high San Francisco Peaks so attracts skiers, hikers, bikers and fitness buffs and lots of snow in the winter. But it’s a great getaway during the hot summer months if you happen to have friends who belong to one of the four private clubs in the area, Forest Highlands, Aspen Valley Golf Club, Pine Canyon and Flagstaff Ranch. Flag, as we call it, it a great place to stop if you’re on a family vacation headed to the Grand Canyon. The most recommended place to stay is Little America which is the only resort in town. Should time permit, Little America will also put you close to Continental Country Club, the only public golf course in town. If you’re an explorer, you can see the beauty and diversity Arizona offers with a 1 or 2 day trip to Northern Arizona. Be sure to take the drive between Sedona and Flagstaff on Route 89 through Oak Creek Canyon, it’s stunning.